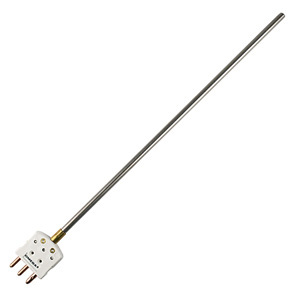 These durable PT100 probes feature a BS EN60751:1996 Class A PT100 element with a stainless steel sheath, terminated with a standard size 3-pin plug. The standard probes have a rigid stainless steel tube sheath, and have an operating range of -30 to +250°C. Standard construction of either style is 3-wire; for pricing of 2 or 4 wire configurations and 1/3 or 1/10 DIN accuracy elements. contact our sales department. † Any sheath length available, refer to pdf data sheet or consult sales for pricing. Quick disconnect type PR-13 probe with mating connector, 3 wire configuration, Class A Pt100 element. 6mm diameter, 150mm long sheath. Quick disconnect type PR-13 probe with mating connector, 3 wire configuration, Class A Pt100 element. 6mm diameter, 225mm long sheath. Quick disconnect type PR-13 probe with mating connector, 3 wire configuration, Class A Pt100 element. 3mm diameter, 150mm long sheath. Quick disconnect type PR-13 probe with mating connector, 3 wire configuration, Class A Pt100 element. 3mm diameter, 450mm long sheath. Nota: Standard probes conform to the DIN 43760 (European) standard curve (Alpha = 0.00385).